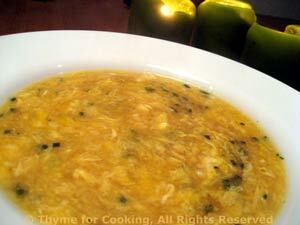 Egg Drop Soup, Thyme for Cooking classic soup for a Chinese Dinner. This would be best with homemade chicken stock but I'll be using 'store-bought'. The trick is to have the egg whisked lightly and only stir once after it's in the hot soup. Clean the green onions: slice off the root, remove 1 layer of skin. Slice thinly, including 2 inches (5cm) of green top. Set aside. Heat 3 cups chicken stock to boiling. Crack egg into a medium bowl and whisk lightly. Dissolve cornstarch into 2 tbs of chicken stock. Add to boiling stock, stirring until thickened and clear. Slowly pour in egg. Stir once gently. Immediately remove from heat. Ladle into 2 bowls. Sprinkle with sliced green onion and serve immediately.